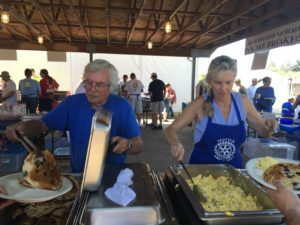 Another Rotary Pancake Breakfast is in the history books! Kudos to all who volunteered for and/or sponsored this much-loved community event. Detailed report to come….. Since it’s the time of year for fairs and festivals, we were treated to a visit from representatives of both the Old Fashioned Festival and the Yamhill County Fair last week. Leslie Lewis introduces Tatiana DeHart (center) and Abigail Berhorst. Leslie Lewis of the Yamhill County Fair Board introduced two of the three Fair Ambassadors–Tatiana DeHart and Abigail Berhorst. (Elsie Duyn was called into work and couldn’t make it.) Leslie indicated that each Ambassador is awarded a $1000 college scholarship. 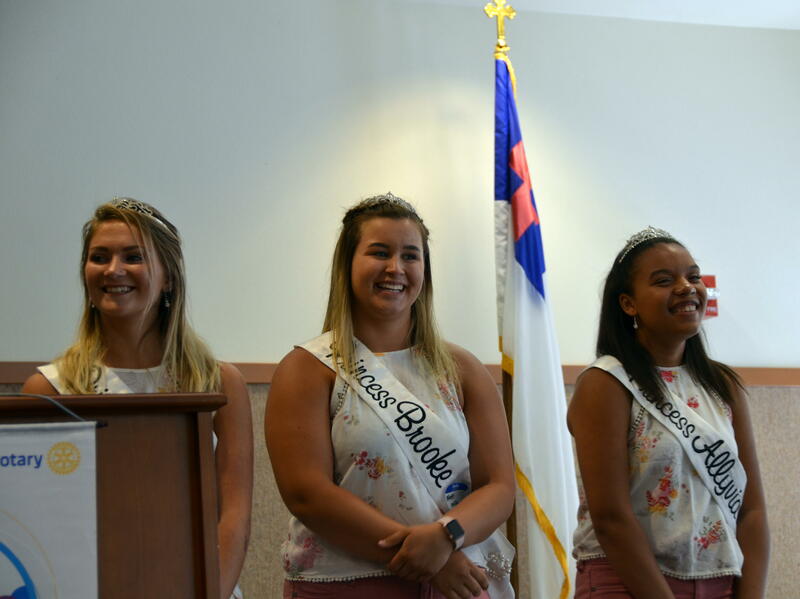 Tatiana is a 2017 graduate of Country Faith Christian Academy in Newberg, and stated that she has looked forward to being a Fair and Rodeo Ambassador for several years. 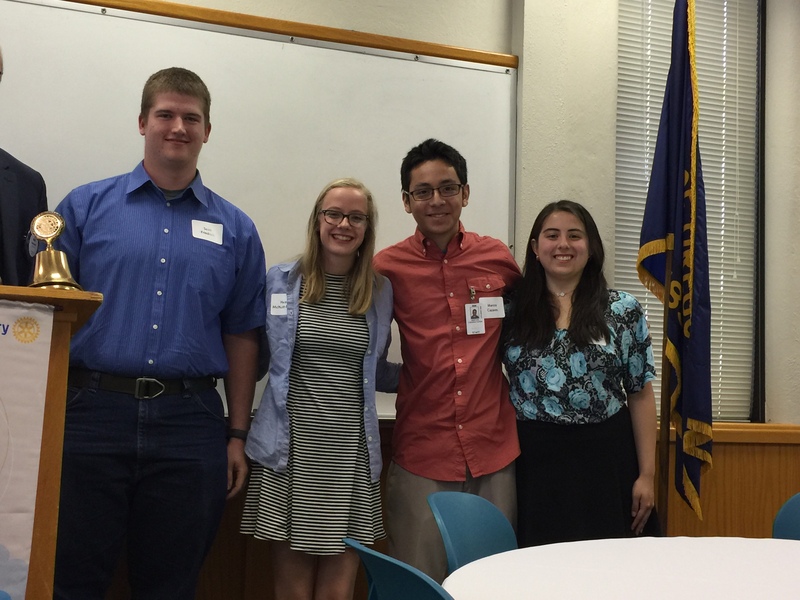 “I am incredibly thankful for my seven years of involvement in 4-H and the Yamhill County Fair. Preparing for the annual County Fair has inspired me to try new things, create goals and to chase my dreams.” Tatiana is headed to Oregon State to become a large-animal veterinarian. Abigail is a 2017 graduate of Yamhill-Carlton High School and has actively participated for nine years at the Fair. “I am so happy to be named as a Fair Ambassador. Our County Fair has given me some of the best experiences of my life and I am very passionate about sharing these wonderful memories.” Abigail plans to attend Eastern Oregon University to major in Agricultural Education. 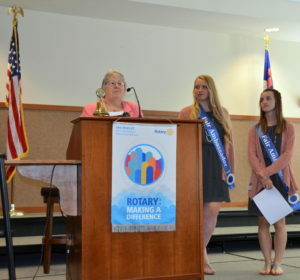 The Ambassadors have a busy summer planned to promote the Fair. They outlined all the activities and events, such as the “Bullmania” Rodeo, concerts, exhibits, carnival, and demolition derby planned this year. The Fair opens Wednesday, August 2 and continues through the 5th. 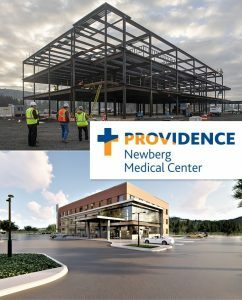 For detailed information and schedules, visit www.co.yamhill.or.us/fair. Princesses Alexis, left, Brooke and Allyvia speak to our club. Princess Alexis will be a senior at NHS this year, and said she is “looking forward to dedicating the summer to bettering our community, alongside Allyvia and Brooke.” She enjoys helping the community as a team captain for Relay for Life, and has over 300 hours of community service. Princess Brooke moved to Newberg in 2006, and the first event her family attended was the Old Fashioned Festival. She said she “fell in love with the parades, carnival and princesses,” and aspired to be a princess herself one day. She just graduated from NHS and will attend Portland State in the fall to study nursing. 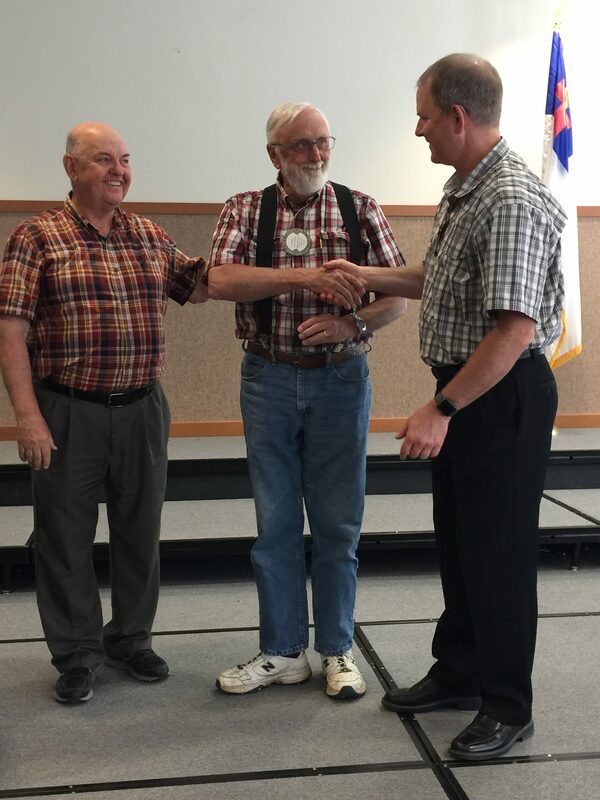 On behalf of President Todd Engle, Om Sukheenai presented Al Herriges with a “10 Years of Service” Award. Congrats, Al! Om also presented a Special Recognition Award to Grant Gerke for his years of service as a chair of the annual auction. Thank you, Grant! 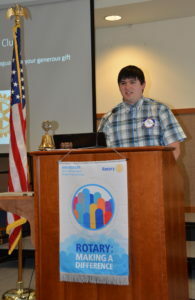 Rotarian Rick Kaufman, who plans to transfer to our club, joined us for the second week in a row. A general discussion was held at the end of the meeting to come up with some ideas for a future community service project for our club. 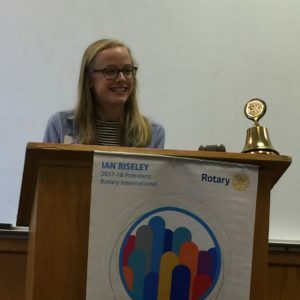 Past President Leah Griffith plans to get a committee together to work on this. If you would like to participate, please contact Leah. Marge O’Connell actually had emergency surgery for a detached retina, a very different and much more complex surgery than the cataract surgery we reported last week. Sorry for the misunderstanding. According to Marge, “Recovery is a matter of several months–vision return is 2 months on average; driving will probably be about 4 months.” Best wishes to Marge for a complete recovery. Special thanks to Auggie Gonzales for the great photos. So glad our photographer is back from Mexico City, where he was able to welcome his sixth grandchild! 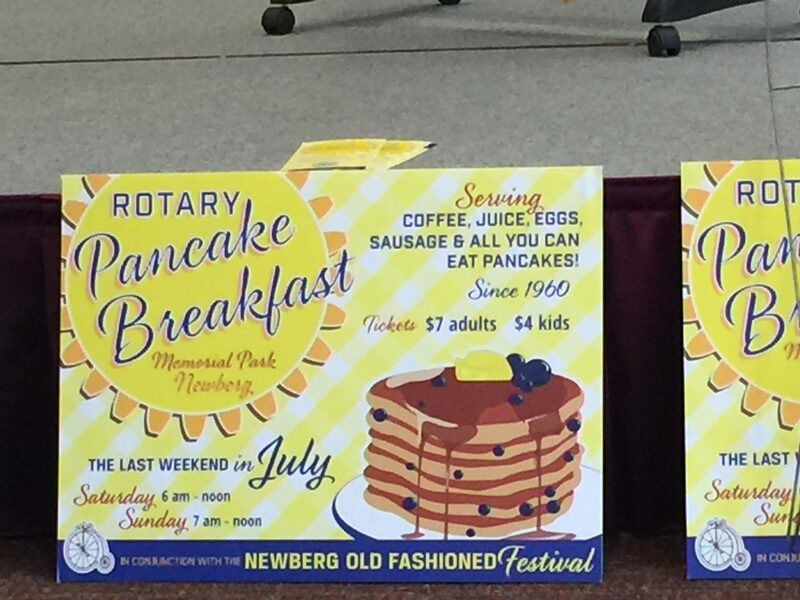 Here comes the Old Fashioned Festival and our annual pancake breakfast fundraiser! Yes, this weekend! There’s still time to volunteer to help out (if you haven’t already). 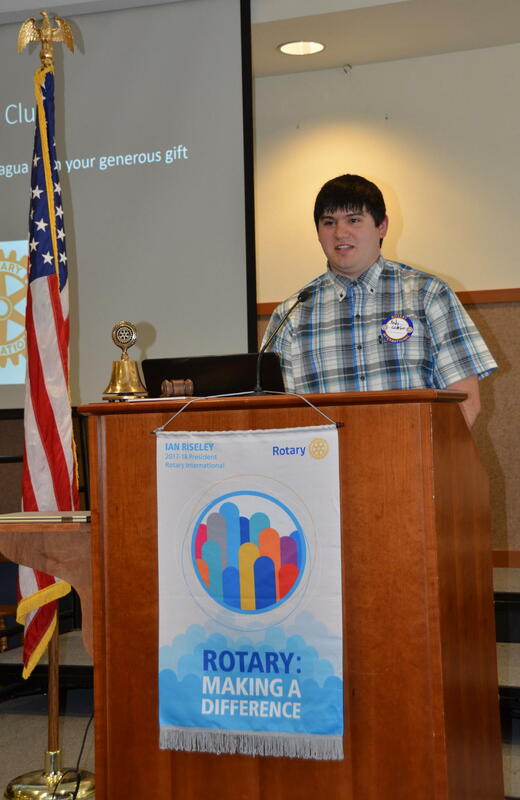 “The goal is to get as many from the community to attend as possible,” Jeff said. Jeff Lane talks about the upcoming pancake breakfast. Our club maintains a storage unit for equipment such as grills, etc. Friday is transport and set-up day. Saturday starts early (4:30 am) for Jeff and Grant, getting the grills and coffee going. Volunteers start arriving about 5 am, and there’s lots to do–put on tablecloths, hang signage, ready the condiments, etc. After it’s all over on Sunday, there’s tear-down and cleanup. All in all, quite a production for a beloved community event. 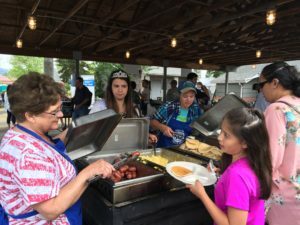 Mike Caruso‘s wife, Amy, was the winning bidder of a special auction package this year which will feature a unique pancake breakfast experience–with a special tent, linen tablecloths, real silverware, china, and a dedicated waiter. Hmmmm….might want to bid on that next year…. 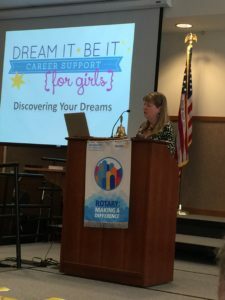 Jackie Lane describes the “Dream It, Be It” program. 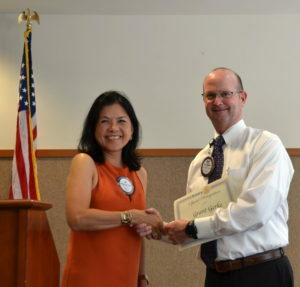 Jeff’s wife, Jackie, was actually our guest speaker. 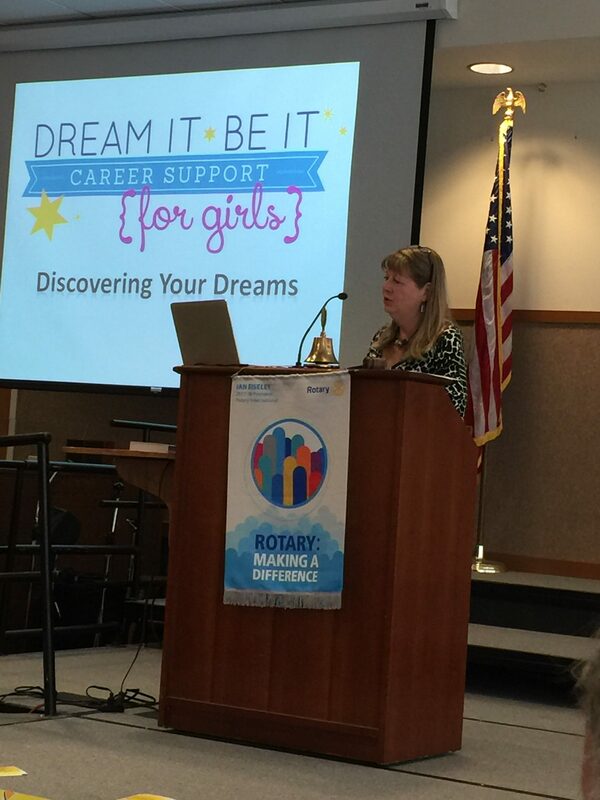 She told us about Soroptimist International and the local club’s “Dream It, Be It” career support program for girls. 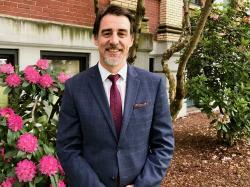 The mission of the organization, which started in California in the 1920s, is to transform lives through education, empowerment and by enabling opportunities. The vision is helping women and girls achieve their individual and collective potential. 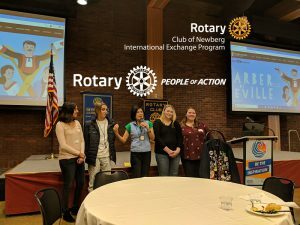 The Soroptimist club in Newberg started in 2009, and has done a number of career-oriented community projects, especially in conjunction with Chehalem Youth and Family Services. 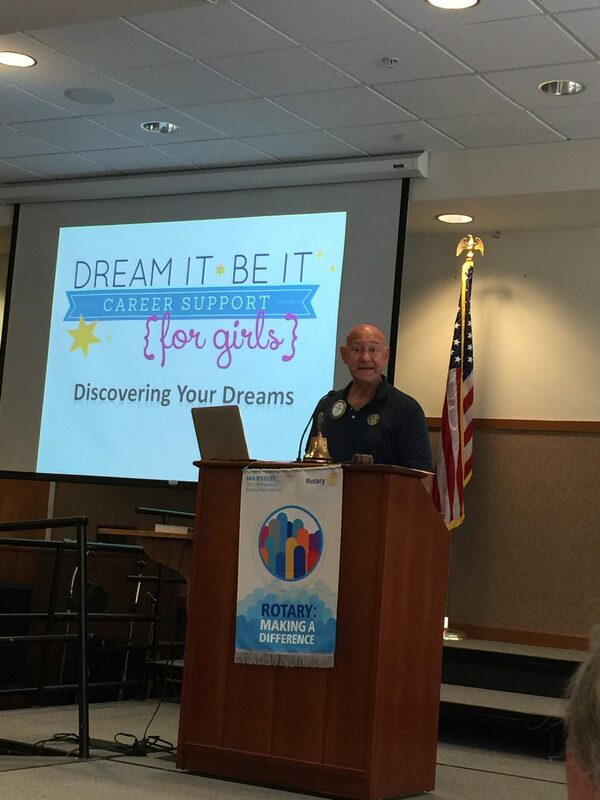 Last year, the club sponsored a full-day seminar for high schoolers in Newberg and Dundee. It featured sessions on discovering dreams, exploring careers, creating achievable goals, rising above obstacles, turning failure into success, balancing stress and putting dreams into action. It also included a professional mentor luncheon, with career guidance talks by a college professor and a jewelry designer. 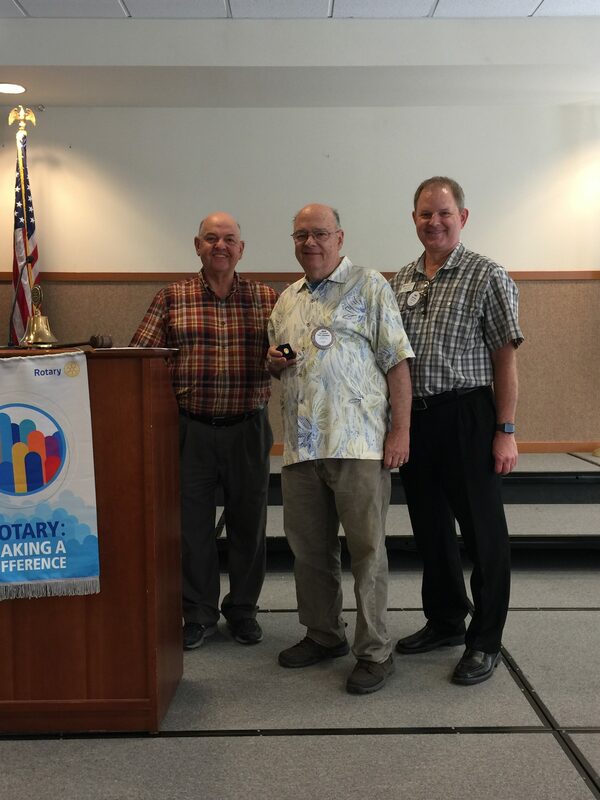 John Kerekanich, center, received his Paul Harris award. Mike Caruso and President Todd Engle congratulate LeRoy Benham on his Paul Harris. 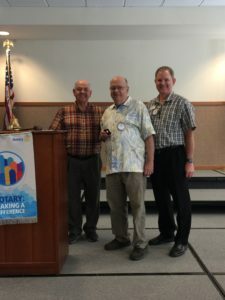 Well-deserved Paul Harris recognition awards were given by Mike Caruso and President Todd Engle to LeRoy Benham, Jack Czarnecki, Ray Hillman, and John Kerekanich for their contributions to the Rotary Foundation. Jack Czarnecki poses for a photo after receiving his award. Ray Hillman, center, smiles after receiving his award. It was a day for spouses! Laura Tilrico‘s husband, Michael, joined us, as did Denise Bacon‘s hubby, Chris Moore. And of course, Jeff’s wife, Jackie Lane, was our speaker. 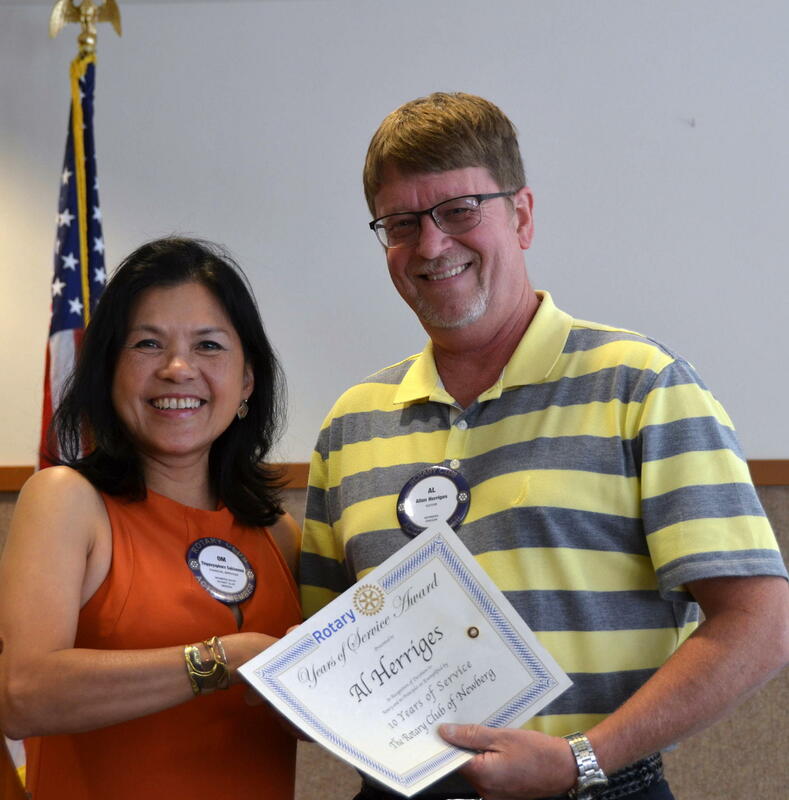 Local businesswoman and Soroptimist Sally Dallas was also Jeff’s guest. 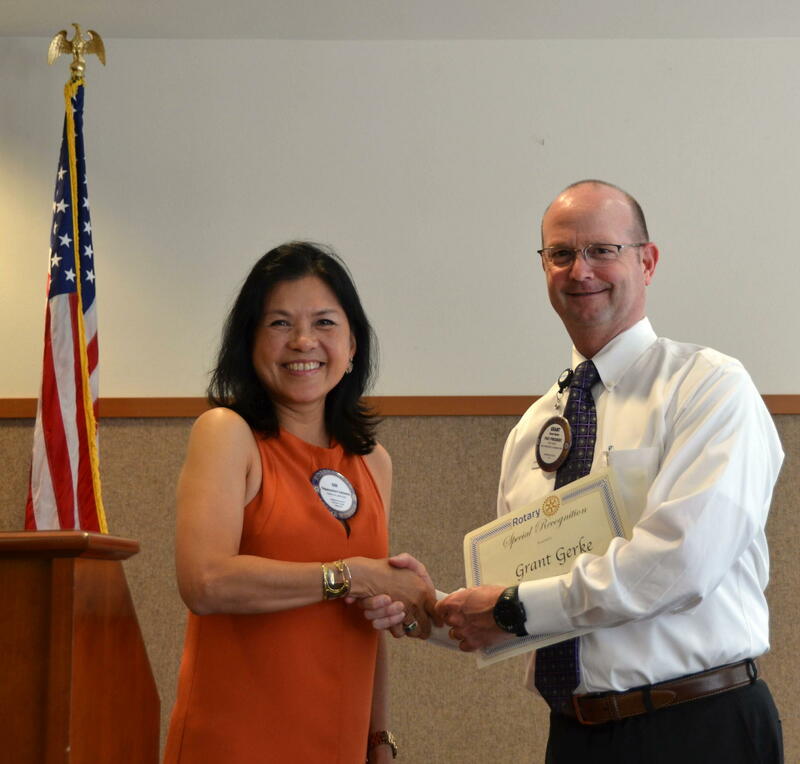 New member Rachel Huber brought Jay Lazaro, the business office manager at Avamere Newberg. Rachel also invited everyone to an event Avamere will have on September 1st, from 10am to 5pm, featuring a BBQ, games, face painting and other fun things. Dr. Rick Kaufman, a Rotarian from Jacksonville who has moved to our area, indicated he will be transferring to our club. Bill Dolan said that the St. Paul Rodeo set a new attendance record this year–52,800! 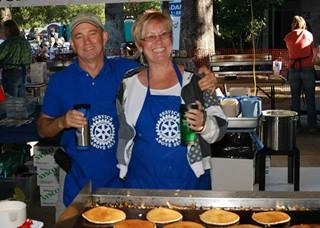 Thanks to all the Rotarians who helped out. Paula Radich said she will miss next week’s meeting as she is going on vacation to the Oregon Coast with her 98 1/2 year old mom and 25 of her closest relatives! Laura Tilrico reported that Marge O’Connell is recovering from cataract surgery. Best wishes, Marge. 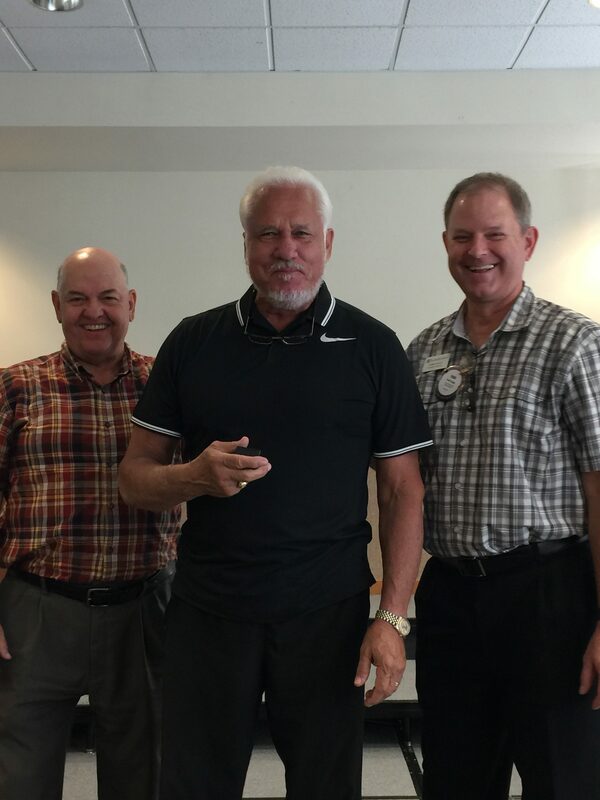 How fitting that Todd Engle‘s first meeting as our new club president was held at Friendsview. The staff always does such a nice job when they host us. Thanks to all, and congratulations, Todd! PANCAKE BREAKFAST COMING RIGHT UP! Promotional materials for this July 29 and 30th Old Fashioned Festival event at Memorial Park are now available for you to use. 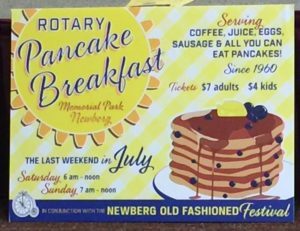 See Jeff Lane to get fliers or rack cards, and help promote this important fund raiser for our club. The results help us do good work in the community. Please see Curt Walker if you don’t have your tickets yet. There are still some unfilled volunteer slots, so sign up via Paula Radich‘s recent email if you haven’t already. Please contact Spike Sumner if you are interested in sponsorship. 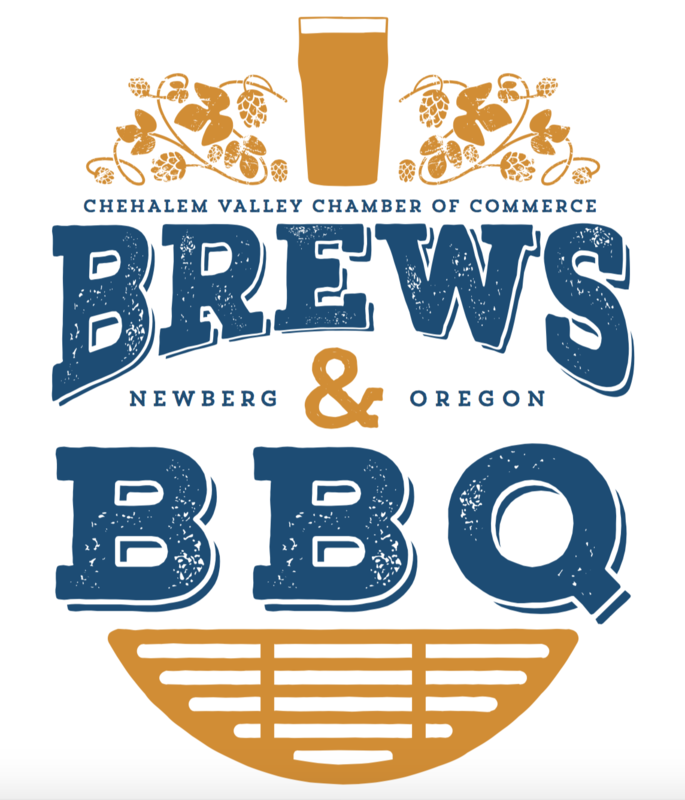 This fun event, sponsored by the Chamber of Commerce, has a new date this year–Friday night, July 21st from 4 to 10pm and Saturday, July 22nd from 12 to 10pm. Location is First Street and Howard. Admission is $5, or VIP entry for $15. 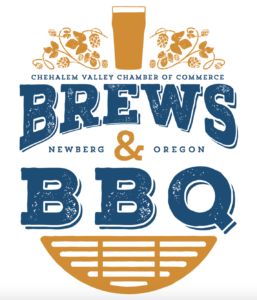 Please contact Sheryl Kelsh at the Chamber for more info: 503-538-2014.
Insider tip: Sheryl says there will be a BBQ competition next year, so get those recipes out for testing…..
Newberg’s summer concert series starts tomorrow night, July 11 at 6:30pm with Johnny Limbo and the Lugnuts. Grab your lawn chair and come enjoy a fun summer evening. Weather is supposed to be great. And be sure to mark your calendar for July 25, when our club teams up with the Earlybird Club to sponsor the concert featuring Dancehall Days. Should be a blast. A representative from the Tigard Noon Club visited our meeting to let us know that their Foundation is helping to sponsor “10 Pianos; 10 Pianists” featuring Michael Allen Harrison and host Bill Schonley. This unique outdoor concert benefits music education and will be on Sunday, July 30 from 6 to 8:30pm at the Reserve Vineyards and Golf Club in Aloha. Order tickets online at http://tengrandsonthegreen.com or call 971-238-7442. 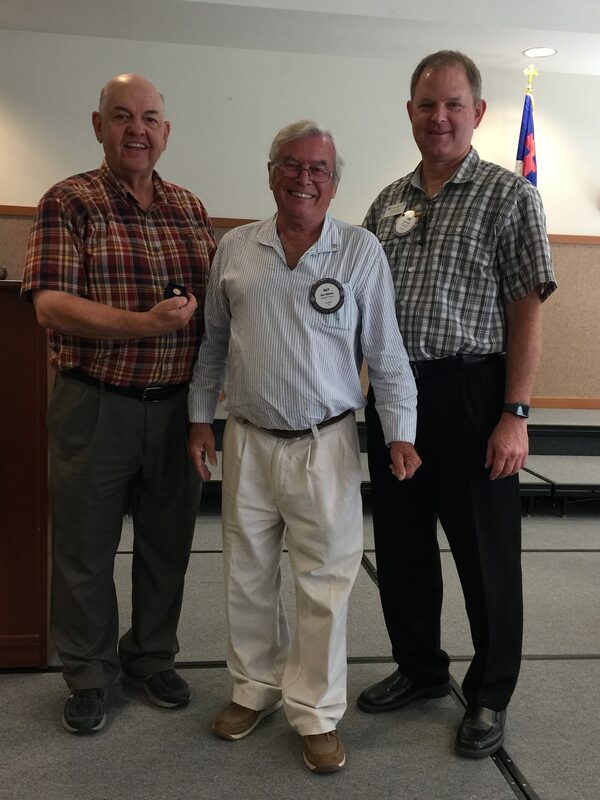 We were honored to have a visit from the new president of the Earlybirds Club, Gary Stewart. 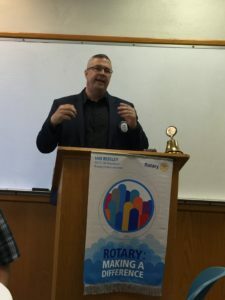 Curt Walker introduced Warren Good, a Rotarian from McMinnville who worked for Providence, and is a licensed realtor in both Nevada and Oregon. Our summer marketing intern from George Fox University, Dominique Thibault, also joined us. Andy Comfort discusses projects in Masatepe. 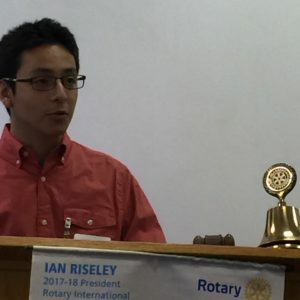 Especially notable are efforts to build preschools and the “One Egg” program, which provides an egg a day to every preschooler in the community to provide nutrition. 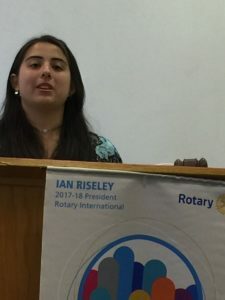 The teams working with the nonprofit have also have been involved with creating an alcohol rehab center, a “Girls Night In” program to provide youth group fellowship, and they have created both egg and pig farms to provide food. To try to get some type of economic activity going, “Beto’s Bistro” was created. Not only does it provide a coffee house, but it addresses what had been a lack of neutral community gathering space. 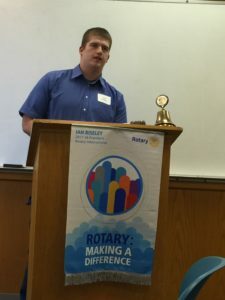 A Chamber of Commerce was started two years ago, and they are working to attract members, and develop programs and activities. You can support these efforts by buying products through Betos.org.